Well, just one day after a tasting dinner with fellow wine lovers in Washington D.C. to taste overlooked vintages in Bordeaux, this evening featured the single vintage of 1998 across France. We thought we would peek at this vintage almost 15 years later, as we are – nearly – into 2013. We focused on various regions, including Chateauneuf du Pape, because it was a good year for Grenache. 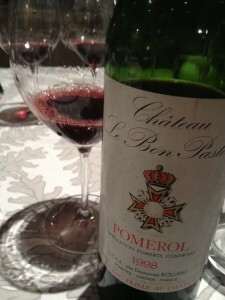 We tasted two Pomerols, as 1998 was good for Merlot – and a fine Graves that contains quite a bit of Merlot. 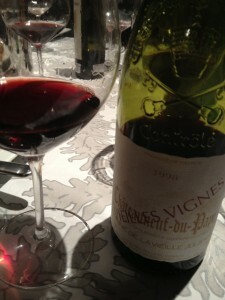 Three Burgundies proved lovely in a vintage that is revealing itself to have both charm and substance. Finally some fine sweeties including an opulent and mightily impressive Yquem, and a more expectedly sprightly Climens. Our most gracious host, Ian Lipner, displayed yet again – as he had done about one year ago – his maestro-like versatility as chef, with various courses ranging from a tasteful salad to wild boar by way of delectable guinea fowl. Our group included Maureen Nelson, Darryl Priest and his wife Nancy, David Ehrlich, David White, Keith Levenberg, Ian and myself. Wines in bold I liked in particular, in red and bold even more and when underlined, the most. Notes from memory, so here goes. 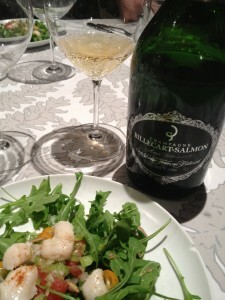 We started with an excellent Billecart Salmon 1998 Champagne, a mix of Pinot Noir and Chardonnay, that was youthful and precise. Brisk and rich, if perhaps just a touch over sweet to me, but maybe it was the salad that accentuated that sweetness. In the end, I came back to this wine fully enjoying it. Then came a Huet Clos du Bourg 1998, which was tight and youthful for its age but with a rather excessively smoky note that annoyed me somewhat. Now, I am not that accustomed to drinking older dry Chenin Blanc from the Loire. The more experienced tasters explained that this represented a fine prototype. I grew to respect its youthful nature, and with time in glass it opened up a bit – and perhaps it was the best match for the salad. But it never really wowed me. A word on the salad. The mix of bay scallops with fresh greens and salted ruby red grapefruit was delightfully accentuated by a dressing of grapefruit and lemon reduction with apple cider vinegar and olive oil (see photo above). 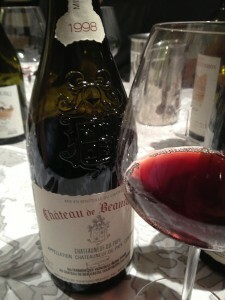 It was in any case far more interesting to drink than the both oxidized and corked Vieilles Vignes of Beaucastel Chateauneuf du Pape (white) 1998… Just a faulty bottle here, although I am not sure it would have been good without the cork problem, because the oxidation was prevalent. The best flight of the night. Served with a wonderfully roasted guinea fowl in a sweet sauce that proved persistently delicious: great stuff Ian! 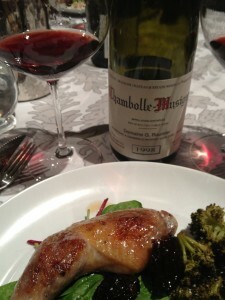 The trio began with a lovely Georges Roumier Chambolle Musigny. A villages wine, it was suave and silky seduction. At first the easiest of the three to enjoy, à point as the French say, with plenty of smoothness. Over time – over the course of the entire dinner, in fact (thanks to Maureen, whose keen and intelligent passion for Burgundy is always welcome, and who thus held on to her glasses ;-)), the next two wines out-shined the Roumier, but that is not detracting from its truly pleasurable performance. Next up was a Louis Jadot Clos Saint Denis Grand Cru, which was rather closed at first, but then really sang, at a tenor level, it being the most concentrated of the three, but lots of ripeness and fruit and excellent structure, with some “iron-like” aspects that intrigued me. A fascinating wine with much contour. 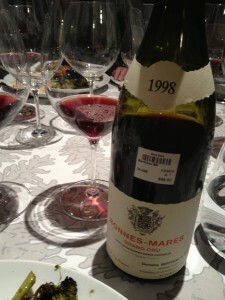 Finally, the Bertheau Bonnes Mares Grand Cru ended up impressing me perhaps the most of the three. Somewhat diffuse at first, it improved noticeably in glass, gaining palate presence and complexity, with fine aromatic perfume and palate elegance, medium plus bodied, and ending with a nuanced finish. Now, this was a let down after the heights of Burgundy. The next serving however was maintaining Ian’s high level cuisine. 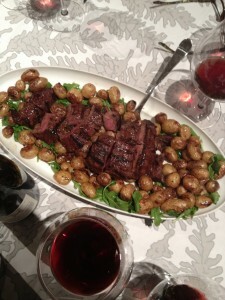 Perfectly roasted potatoes with tender flatiron steak… I was pacing myself and took a small piece of the meat, but was happy to have one other piece that was leftover after everyone else had been served. Delicious. We began the Bordeaux adventure with a good Les Carmes Haut Brion from Pessac Leognan. I recall staying at the estate on a visit to Bordeaux a few years ago, before the Furt family sold it. A supremely charming estate, it atypically uses up to 50% Merlot in the mix with quite a lot of Cabernet Franc, as well. I have always thought this to be somewhat under-the-radar Pessac Leognan. How was the 1998? Well, it did have a touch of brett, but not so much to detract for my senses. In fact, I liked its fluidity best. It seemed the least intense of this trio and in that sense, I liked it best! But it was also lacking some intensity to be honest. 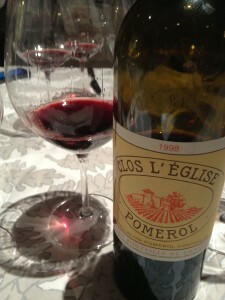 1998 is a fine vintage in Pessac Leognan, and perhaps I was expecting more. The next two wines are interesting in that they have similar styles. Michel Rolland consulted at Clos l’Eglise as has Alain Raynaud. Hélène Garcin-Lévêque runs the six hectare property, which was acquired in 1997 by her mother Sylviane Garcin-Cathiard, a sibling of Daniel Cathiard who owns Smith-Haut-Lafitte in Pessac-Léognan. I thought this was a good example of the wine, which is a modern styled Pomerol, meaning quite rich and big, with some noticeable extraction (and I could taste some oak derivation even 15 years later) that lead to just some drying on the finish. But the mid palate was enjoyable. I miss some freshness here though. This is not La Fleur Petrus or Latour a Pomerol, for example. But it was good enough. Then came Michel Rolland’s own wine, Bon Pasteur. When tasted blind in London earlier this month, the 1995 (it was a 1995 horizontal, blind) seemed tired but it may have been a lesser bottle. But the one time I had the 1998, four years ago, I liked it. And tonight it did not let me down. 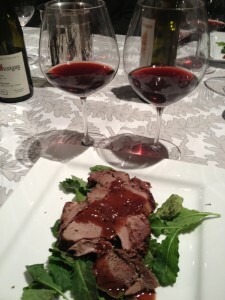 The darkest colored of the three wines, with intense, dark fruit flavors, it was also fine on the mid palate. Perhaps not as fresh and tasty as when I had last had it, but still going strong. Lovers of the style will more than likely swear by it. The next flight was interesting and somewhat of a disappointment. The Clos des Papes 1998 seemed less than impressive. I recall trying it at the domain back in 2003. It was good but not super. I preferred the 1999 and the 2000. And after this evening, I think I would easily rank 1999 over 1998 at this estate. Keith got a lot of brett. I was not sure what to think. I did not get anything horse like or crappy. Perhaps some Band-Aid, but that kind of blew off and one was left with bright red fruit, which was a good thing. And the palate displayed some fine depth. But this wine left me with more question marks, and rather than enjoying it, I was left inspecting it, rather regularly. The opposite was the case of the Chateau de Beaucastel, which perhaps proved to be my overall favorite Chateauneuf du Pape of the evening (there is a second flight of two). Why? Lovely and even poignant garrigue notes on the palate, a mineral aspect on the nose, but above all the fine structure one gets no doubt from the Mourvedre component. Although if memory serves me correctly, the 1998 had more Grenache than is usual because of the success of that variety in 1998. In any case, this was quite streamlined and polished and I do not understand some naysayers on both wine-berserkers and the UK wine forum. This was tasting quite nicely and now I am glad to have four bottles of it. By the time we got to the Chateauneuf du Pape, we also enjoyed a third main course: wild boar. The meat was very good and so was the gravy. Kudos to Ian. Alas the first wine of this second flight was “hot tasting” and hard on the finish. I was expecting much more from Vieux Donjon. But let’s just hope that it was a faulty bottle. The next wine was close to being my favorite. But the problem is that I get over sensitive to alcohol levels. Whereas the Beaucastel’s label claimed 13.5%, the label from the Domaine de la Vieille Julienne Vieilles Vignes stated 14.5% and it tasted more like 15%. But let’s forget this for a moment and focus on the good stuff, because there was quite a bit: richness and flavor intensity and a certain closed aspect – at first – that displayed a potential for aging. But some heat and slight drying on the finish bugged me at least. I am tempted to give this a bold and red, but I still like the Beaucastel more. But take heart, true-blue Chateauneuf du Pape lovers will rate this better than I. Well, for the end game, we had a tasty cheese plate, and that gooey Brie was particularly magnifique. I could not get enough of it, as Ian kept going back and warming it – as well as the crackers. This was getting fun. But we started with the best wine of them all, my wine of the night, Burgundies included, proved to be a Bordeaux: the mighty Chateau d’Yquem. This tasting reminded me, yet again, why Yquem alone was classified in 1855 as “superior first growth” : no other wine, either from the Medoc or Sauternes, had that superior adjective in its classification. I recall tasting this in Bordeaux at La Tour Blanche when it had just been released, Vinexpo 2001. Every Vinexpo, perhaps every year, but noticed internationally because of Vinexpo, La Tour Blanche hosts a tasting of sweet wines from around the world: from German ice wines to Hungarian Tokay. 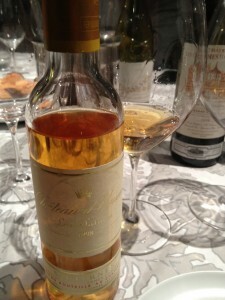 At that time, the Yquem seemed less than impressive, lacking flavor intensity and its famous layered palate presence. But it was just a baby. Now, over 10 years later, it was opulent and spiced in a nuanced manner than begged the drinker to have more. The half bottle was gone very quickly… Needless to say, I shamelessly went on wine-searcher.com and purchased a few halves before publishing this text. This is – as David White correctly pointed out – rather underrated Yquem. Alas the Doisy Vedrines Barsac was hopelessly oxidized. So a faulty half bottle. But the Chateau Climens was lovely. It has more energy than Yquem, seemed lighter and more influenced by its acidity. Standing alone, it would have been just dandy. But it was in this pairing overshadowed by Yquem, because of the sheer opulence that was never heavy or overbearing. Wait, I am supposed to be writing about Climens… I have had experiences where the Climens is better than the Yquem (such as a 1976 Climens impressing a bunch of Bordeaux winemakers over dinner more than a 1983 Yquem) but as much as I liked the Climens – white fruit, citrus like energy – it was just no match against Yquem in 1998, at least based on these two half bottles. Finally, we also enjoyed a bottle of Zind Humbrecht Rotenberg Pinot Gris VT. Now, I had done a double vertical of Brand and Rangen Riesling last month in Merano Italy with Olivier Humbrecht, and his wines always impress me. But by the time I got to this Pinot Gris, I was still heady from the Yquem. It was good, but from memory, I found it slightly on the over sweetish side of the spectrum. A lovely evening was had by all. We did end up talking politics towards the end, but this is to be expected in Washington D.C. Someone made the joke: next year, we’ll talk religion. Thanks to Ian for his supreme hospitality. Hope to see you all soon again! 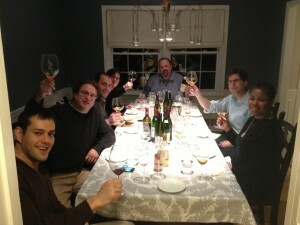 Panos, you know the Bordeaux would have tasted better if you had opened them before the Burgundies. I assume Maureen told you to drink the Burgs first? Great write up Panos. I talked to Ian a bit about this today, but 1998 is a nice sleeper vintage in Burgundy that’s drinking nicely at the moment. In an age of steep prices, it’s great to have vintages like ’98 that provide a safe harbor for us wine drinkers. Nice presentation! 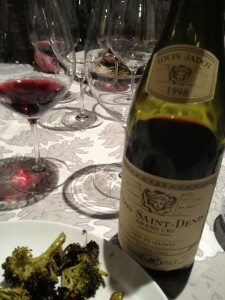 1998 vintage wine is undoubtedly the greatest vintage.